Online diamond trading platform Diamnet has expanded its reach, adding over 50,000 diamonds to its list in the past two months to bring the total number of stones available to its retailer members to more than 250,000. 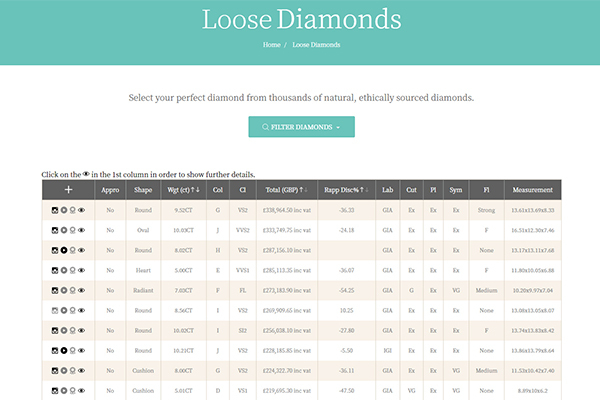 Diamnet has already attracted more than 155 retailers to its diamond trading platform since its launch in August 2018, providing them with a live wholesale diamond list made up of stones from leading dealers and cutters in UK, Antwerp, Israel and India. It is a free, online service for retailers, enabling them to source specific stones and compare quotes at the click of a button. In many cases the stones can be supplied and delivered directly to the retailer within 48 hours. Retailers can then order the loose stone or a fully finished ring from one of the many UK mount manufacturers with which Diamnet works. The addition of new suppliers and the increased number of stones on the list ensures that retailers have the widest range of prices and availability in the industry – all at the touch of a button. Diamnet takes any hassle out of dealing with a range of different suppliers, because the stones are all shown in one place and the retailer deals with one point of contact for ordering, returns and payment. Diamnet’s next step has been the launch of its revolutionary retailer white label website package in February, which helps independent retail jewellers compete with online giants. The new consumer-facing sites make the existing Diamnet service available to customers, enabling them to compare the retail prices of thousands of diamonds and mounts, and to create their own ring, which can then be bought via the retailer, either online or in store. The white label sites are branded to each individual jeweller and run in parallel with a retailer’s existing website, offering the consumer a seamless transition between the two sites. By sharing resources across different retailers, Diamnet can offer this service for a fraction of the costs that would be associated if a retailer were to set up a similar service on their own.